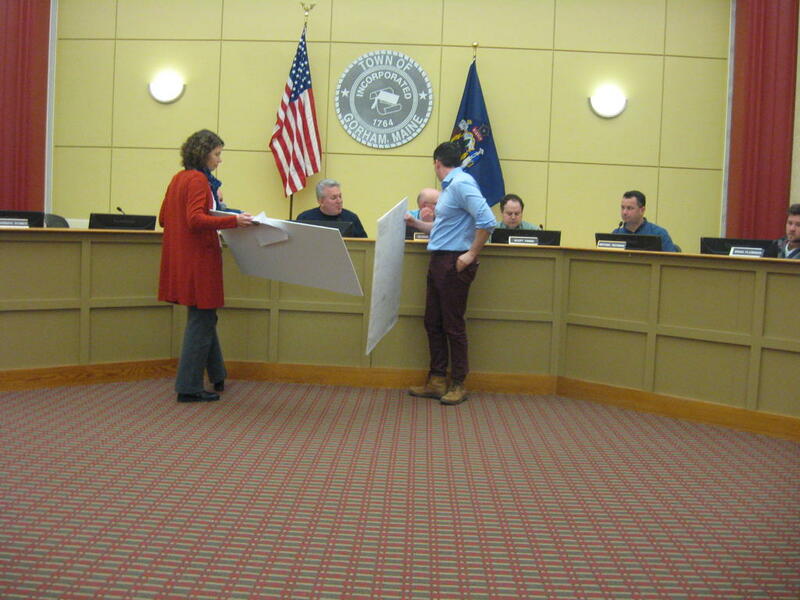 Sashie Misner of Gawron Turgeon Architects and Nate Howes, representing Avesta Housing Development Corp., Monday show the Gorham Planning Board details of a proposed expansion at Ridgewood I, a senior citizens housing project off School Street. GORHAM — Avesta Housing Development Corp. is seeking permission to add 27 residences for ages 55 and up at its Ridgewood I facility off School Street. Nate Howes, representing Avesta, and Sashie Misner of Gawron Turgeon Architects discussed the project with the town’s Planning Board Monday. The board has not yet received an official application, Chairman Edward Zelmanow said. Town Planner Tom Poirier said the board will decide whether a site walk is needed. A vacant office space will be torn down to make way for the project. The proposal would be a four-story building with 22 one-bedroom apartments and five two-bedroom apartments. Solar panels would be installed on the roof. Ridgewood 1 has 20 units. Avesta received approval in 2015 to build the three-story Ridgewood 2 with 24 units and opened that in 2016. Plans include adding 11 parking spots to the existing 47 spaces at the combined Ridgewood 1 and 2 site. Avesta hopes to work with Metro, which now serves Gorham with a bus stop on campus in addition to stops on each side of Main Street in Gorham Village, to add a stop at Ridgewood. Across School Street from the University of Southern Maine campus, the Ridgewood development was once the site of the Charlotte Millett Elementary School.